AbRam Khan, the third kid of Shah Rukh Khan, is paparazzi's one favorite child. His stardom is not a single point less than his father Shah Rukh Khan. AbRam is often being clicked by shutterbugs with mommy or roaming with his maids with an iPad in his hand on the streets of Bandra. Recently this little munchkin was spotted at Abhishek and Aishwarya Rai Bachchan's daughter Aradhya's 7th birthday bash. 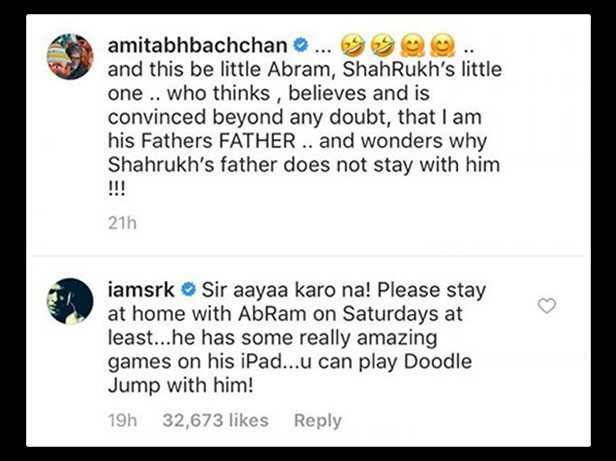 AbRam got special attention when he was clicked with the legend Amitabh Bachchan and the veteran actor described his meeting with Shah Rukh's lil one on his Instagram. He captioned it, ".. 🤣🤣🤗🤗 .. and this be little Abram, ShahRukh’s little one .. who thinks , believes and is convinced beyond any doubt, that I am his Fathers FATHER .. and wonders why Shahrukh’s father does not stay with him !!!" This is not done yet even Shah Rukh Khan commented further on this post. Check it out below. There's no doubt in saying that Shah Rukh Khan and Amitabh Bachchan makes the best father-son duo on the big screen. The two has shared the screen space on multiple occasions. We wonder if AbRam happened to watch Karan Johar’s Kabhi Khushi Kabhie Gham (2001) recently which made him wonder if just like the film, SRK and Big B are real-life father and son.